Catastrophic releases of methane gas from hydrates (clathrates) have the potential to cause rapid climate changes. Today, methane hydrates are stored along continental margins (i.e. at intermediate water depths, from 250 m to several thousand meters water depth), where they are stabilized by water pressure and temperature. Methane hydrates may become unstable under influence of ocean warming or slope instability1-2. The estimated present-day reservoir of carbon stored in methane hydrates1,3 is about 10,000 Gt (giga ton), which is a substantial amount compared to 38,000 Gt carbon stored in the oceans, 2000 Gt in soils and plants, and 730 Gt in the atmosphere4 . This implies that instability of these hydrates and the subsequent release of methane gas into the atmosphere could potentially cause strong climatic warming through an enhancement of the greenhouse effect. The Paleocene/Eocene thermal maximum (PETM, ~55.5 Million years ago) is a well-known example from the past of a period with drastic climate change due to massive releases of methane from hydrates5-6. Carbon isotope measurements in ocean cores with sediments from the PETM suggest that 1500-2000 Gt of methane carbon was released within a few thousand years5,7-9. This massive methane release had a profound effect on climate. 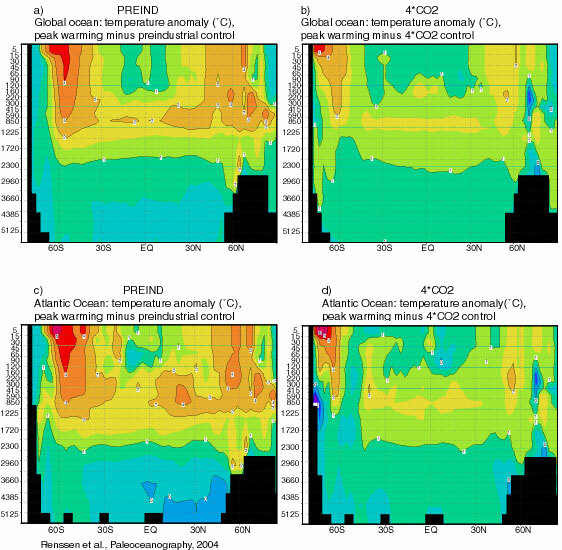 Paleoceanographical evidence from ocean cores indicates that ocean temperatures increased abruptly by 1°C to up to 8°C, depending on the location10-11. It has also been suggested that large temperature swings during the last glacial have been caused by abrupt releases of methane hydrates12-13. In addition, there is growing concern that the expected future global warming may lead to hydrate instability and thus to an enhanced emission of methane, imposing a strong positive feedback that amplifies anthropogenic warming. It is thus very important to quantify the impact of such a methane hydrate scenario on the climate system. To study the climatic response to a massive methane release from gas hydrates, we have carried out two 2500-year long numerical experiments performed with a coupled atmosphere-sea ice-ocean model. With this model, we first simulated two different equilibrium states that were used as a reference climates: 1) a state with preindustrial (1750 AD) forcings, hereafter PREIND, and 2) a much warmer climate state with the same forcings as (1), but with a four times higher atmospheric CO2 concentration, hereafter 4*CO2. These two climate states were perturbed by prescribing a methane emission scenario based on the PETM, involving a sudden release of 1500 Gt of carbon into the atmosphere in 1000 years. This scenario (see Figure 1) has been computed by Schmidt & Shindell16 and involves a huge increase in atmospheric methane concentration from 735 to almost 1600 ppbv. In the PREIND case, the emission scenario represents a radiative forcing of 5.8 W/m2 at the top of the atmosphere, whereas in the 4*CO2 case this is 4.0 W/m2 due to a saturation effect under high carbon dioxide levels. Figure 1: Prescribed emission scenarios, calculated by Schmidt and Shindell16. 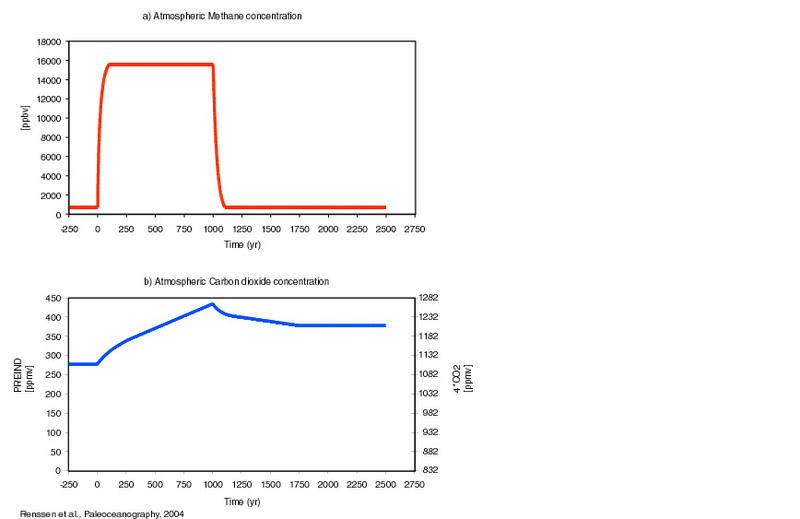 The upper graph shows the evolution of the atmospheric methane concentration, whereas the lower graphs depicts the prescribed time-series of carbon dioxide. The scenario assumes that the released methane is oxidized into carbon dioxide. Please note that the two y-axes of the lower graph refer to the two different states that are perturbed (left axis is valid for PREIND= preindustrial forcings, right axis is valid for 4*CO2= state with preindustrial forcings AND a four times higher carbond dioxide concentration). As expected, the scenario causes pronounced warming in the model (Figures 2 and 3). In the PREIND case, (black curve) the total global surface warming amounts to 2.6°C after 1000 years, while this is 1.5°C in the 4*CO2 case. In both experiments, two thirds of this warming occurs within the first 250 years after the start of the methane pulse. After year 1000, when the methane concentrations drop rapidly to their original level, the temperatures initially follow this trend, but then (after year 1500) stay at a relatively high value (compared to the initial state) because of the long life time of carbon dioxide in the atmosphere. Figure 2: simulated global surface response to massive methane release scenario (started at year 0). The first 250 years represent the two initial states, with the black curve representing the PREIND case, and the gray upper curve representing the 4*CO2 case. The temperature increase is not equally distributed over the globe, as the warming is more expressed at high latitudes than in the tropics (Figure 3). This is caused by the involvement of two strong positive feedbacks in which sea ice plays an important role: 1) the ice-albedo feedback, and 2) the ice-insulation feedback. The warming causes rapid melting of the sea ice cover, lowering the surface albedo and reducing the insulating effect of the sea ice, resulting in an amplification of the warming at high latitudes. 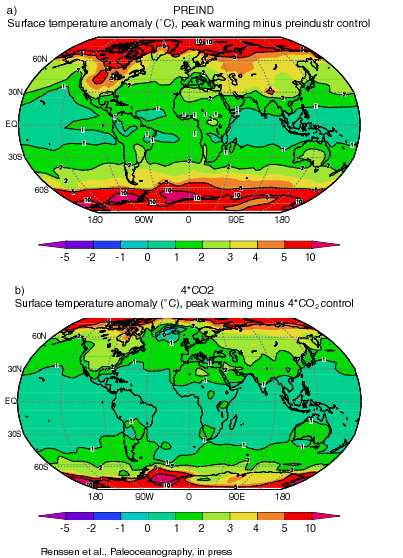 Figure 3a-b: Simulated global response in temperature to a massive methane release scenario. Note the strong warming at high latitudes, which reaches 10°C compared to the reference climate states. In the ocean, a preferential heating of the intermediate waters is noted when looking at temperature vs depth profiles (Figure 4). This is important, as the methane hydrates are presently stored at intermediate water depths, and an increase of temperatures may thus produce additional instability of the methane hydrates. Consequently, a massive release of methane from hydrates has the potential to lead to a chain of positive feedbacks that could result in even stronger warming than simulated here. In the 4*CO2 case, the warming is less than in the PREIND case. This is partly due to the smaller radiative forcing in the 4*CO2 case (see above) and partly because the feedbacks involving sea ice are less powerfull in a warmer climate like the 4*CO2 reference state. However, the warming in the deep ocean is more effective in the 4*CO2 case than in PREIND (see Figure 4). This is the result of the formation of relatively warm bottom water in the Southern Ocean in the 4*CO2 case (compare Fig. 4b and 4a). The model results are in general agreement with paleoclimatic evidence from the PETM. Renssen, H., C.J. Beets, T. Fichefet, H. Goosse, and D. Kroon (2004) Modeling the climate response to a massive methane release from gas hydrates, Paleoceanography 19, PA2010, doi: 10.1029/2003PA000968. References (1) Buffet, B.A., Clathrate Hydrates, Annu. Rev. Earth Planet. Sci., 28, 477-507, 2000. (3) Kvenvolden, K.A., Methane hydrate � a major reservoir of carbon in the shallow geosphere? Chem. Geol., 71, 41-51, 1988. (4) Prentice, I.C., et al. The carbon cycle and atmospheric carbon dioxide, In: Climate change 2001: The scientific basis. Contributions of Working Group I to the third assessment report of the IPCC, edited by J.T. Houghton, et al., Cambridge University Press, Cambridge, UK, pp 183-237, 2001. (5) Dickens, G.R., J.R. O'Neil, D.K. Rea, and R.M. Owen, Dissociation of oceanic methane hydrate as a cause of the carbon isotope excursion at the end of the Paleocene, Paleoceanography, 10, 965-971, 1995. (6) Dickens, G.R., M.M. Castillo, and J.C.G. Walker, A blast of gas in the latest Paleocene: simulating first-order effects of massive dissociation of oceanic methane hydrate, Geology, 25, 259-262, 1997. (7) Bralower, T., D.J. Thomas, J.C. Zachos, M.M. Hirschmann, U. Röhl, H. Sigurdsson, E. Thomas, and D.L. Whitney, High-resolution records of late Paleocene thermal maximum and circum-Caribbean volcanism: is there a causal link? Geology, 25, 963-966, 1997. (8) Bains, S., R.M. Corfield, and R.D. Norris, Mechanisms of climate warming at the end of the Paleocene, Science, 285, 724-727, 1999. (9) Thomas, D.J., T.J. Bralower, and J.C. Zachos, New evidence for subtropical warming during the late Paleocene thermal maximum: stable isotopes from deep sea drilling project site 527, Walvis Ridge, Paleoceanography, 14, 561-570, 1999. (10) Thomas, D.J., J.C. Zachos, T.J. Bralower, E. Thomas, and S. Bohaty, Warming the fuel for the fire: evidence for the thermal dissociation of methane hydrate during the Paleocene-Eocene thermal maximum, Geology, 30, 1067-1070, 2002. (11) Zachos, J.C., M.W. Wara, S. Bohaty, M.L. Delaney, M.R. 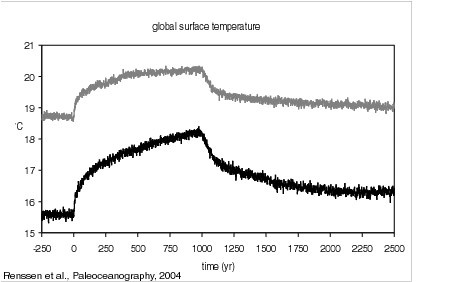 Petrizzo, A. Brill, T.J. Bralower, and I. Premoli-Silva, A transient rise in tropical sea surface temperature during the Paleocene-Eocene Thermal Maximum, Science, 302, 1551-1554, 2003. (12) Kennett, J.P., K.G. Cannariato, I.L. Hendy, and R.J. Behl, Carbon isotope evidence for methane hydrate instability during Quaternary Interstadials, Science, 288, 128-133, 2000. (13) Kennett, J.P., K.G. Cannariato, I.L. Hendy, and R.J. Behl, Methane hydrates in Quaternary climate change; The clathrate gun hypothesis. American Geophysical Union, Washington DC, 224 pp., 2002. (14) Opsteegh, J.D., R.J. Haarsma, F.M. Selten, and A. Kattenberg, ECBILT: A dynamic alternative to mixed boundary conditions in ocean models, Tellus, 50A, 348-367, 1998. (15) Goosse, H., and T. Fichefet, Importance of ice-ocean interactions for the global ocean circulation: a model study, J. Geophys. Res., 104, 23,337-23,355, 1999. (16) Schmidt, G.A., and D.T. Shindell, Atmospheric composition, radiative forcing, and climate change as a consequence of massive methane release from gas hydrates, Paleoceanography, 18, art. No. 1004, doi: 10.1029/2002PA000757, 2003.